Cars are, and will for the foreseeable future continue to be, an incredibly important component of our society. In new research Guang Tian looks at the models used by transport planners to determine how often people use their vehicles and how many they are likely to own. He finds that people who live in more compact and mixed used developments in cities tend to own fewer cars and take fewer trips compared to their suburban counterparts. These results show that traditional transport planning models are overestimating the traffic impacts and parking needs of new ‘smart growth’ schemes which may in turn be discouraging the spread of such developments. Cars are a ubiquitous part of modern society – a least for the time being. So, how we use vehicles is of interest, not just from a transportation point of view, but also in terms of energy and the environment. Over half of the world’s oil and about 30 percent of total commercial world energy are consumed by the transport sector. In 2013, about 31 percent of total US CO2 emissions and 26 percent of total US greenhouse gas emissions were generated by transportation. Vehicle trip generation and vehicle ownership models are used by policy makers to identify factors that affect vehicle miles travelled (VMT), and therefore to address problems related to energy consumption, air pollution and traffic congestion. Guidelines for trip and parking generation in the United States come mainly from the Institute of Transportation Engineers (ITE). The ITE Trip Generation Manual and Parking Generation manuals are considered “bibles” in transportation planning. However, these manuals focus on suburban locations with limited transit and pedestrian access. As a result, they overestimate vehicle trips and parking demands generated at urban sites. In travel research, influences of the built environment on travel behavior are termed as Ds (density, diversity, design, destination accessibility and distance to transit). Demographics are considered as the sixth D, even though not forming part of the environment, because it also influences travel behavior. As D values increase (except distance to transit), the cost of vehicle trips decrease relative utility increases and people switch from one type of transport to another, such as from their cars to bikes or buses. Compact developments that concentrate residents, workers and retail shops in close proximity to one another can “degenerate” vehicle trips. Households that live in dense, mixed-use and transit-served areas tend to own fewer automobiles, a phenomenon called “car shedding”; at the same time, they make more walking, bike and transit trips. In recent research, my colleagues and I examined how many fewer vehicle trips are generated, and how much less parking demand is generated, by different housing types in different settings, from low density suburban environments to compact, mixed-use urban environments. Using household travel survey data from 30 diverse regions of the United States, we’ve conducted several statistical analyses. Our results show that vehicle trip generation and vehicle ownership (and hence parking demand) decrease with the compactness of neighborhood development, measured with a principal component that depends on activity density, land use diversity, percentage of four-way intersections, transit stop density and employment accessibility (after controlling for sociodemographic factors). As Figure 1 shows, average vehicle trip rates per person are higher for single-family detached than single-family attached households, and for single-family attached than apartments and condos (multifamily units). Also, average vehicle trip rates per person drop off with the increase of neighborhood compactness. The drop off in vehicle trip rates with compactness is far more pronounced between average and compact neighborhoods than between sprawling and average neighborhoods. Comparing the extremes, single-family households in sprawling neighborhoods generate 2.08 vehicle trips per person per day, while multifamily households in compact neighborhoods generate only 0.88 vehicle trips per person per day. Figure 2 shows that households in single-family detached homes own more cars than those in single-family attached housing, and those in single-family attached housing own more than those in apartments and condos (multifamily housing). 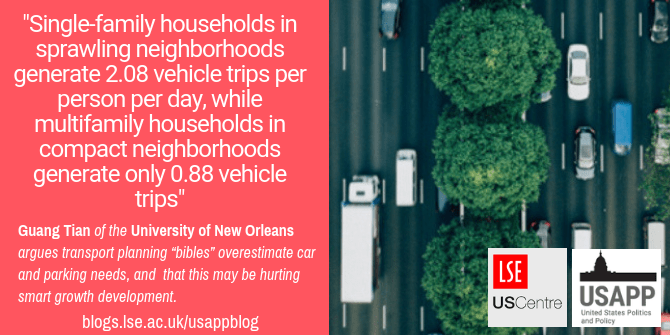 Also, households in sprawling neighborhoods own more cars than those in average neighborhoods, while those in average neighborhoods own more cars than those in compact neighborhoods. The drop off in vehicle ownership rates with compactness is consistent between average and compact neighborhoods as it is between sprawling and average neighborhoods. Again, comparing the extremes, single-family households in sprawling neighborhoods own 2.33 vehicles per household, while multifamily households in compact neighborhoods own only 0.74 vehicles per household. Smart growth, as an alternative to auto-orientated sprawling development, encourages mixed residential and nonresidential land uses in walkable communities with transit options and nearby essential destinations. Increasingly, planners, scholars, innovative developers and local officials across the world promote smart growth as an antidote to many of the ills associated with urban sprawl. It is vitally important to accurately estimate the traffic impacts of a smart-growth development if communities are to reward such projects through lower exactions and development fees or expedited project approvals, and to right-size parking requirements. However, lacking a reliable methodology for adjusting trip and parking generation rates, communities relying on guidelines from the Institute of Transportation Engineers are led to understate the traffic benefits of mixed-use development proposals and therefore discourage otherwise desirable developments. Our work captures the phenomena of ‘trip degeneration’ and ‘car shedding’ as development patterns become more compact which in turn exposes the potential for significant savings while developing urban projects. This article is based on the paper, ‘Trip and parking generation rates for different housing types: Effects of compact development’, in Urban Studies. Guang Tian is an Assistant professor in the Department of Planning and Urban Studies at the University of New Orleans.